L’Hospitalet de Llobregat (Barcelona). The Audie Norris Basketball Camp is looking forward to hearing from our guest speaker today, Miguel Panadés. Time for English class today with Audie and Luis, fun and educational. 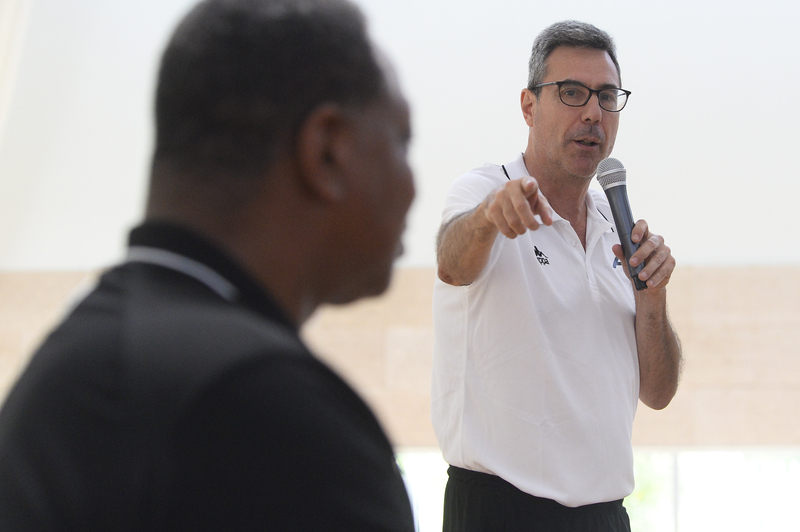 The second day of the Campus has been very intense and we have been able to enjoy the presence of Miguel Panadés, member of the Spanish Sports Federation, he took the campers down memory lane with a very interesting talk recalling golden eras of Barça basketball, when Audie wore the colors of the Barça and the Palau was filled Blau Grana fans to see him play. Panadés was working as a journalist for 25 years in the magazine Gigantes, so he is one of the people with extensive knowledge in Spanish basketball. Miguel stated that Aíto Garcia Renesses the Head Coach of F C Barcelona team that signed Audie Norris to play for them, told him many years ago, during Audie’s first preseason training session of with F C Barça, that “they had signbed a very very good player”. Panadés maintains a great friendship with Audie and did not miss any of his games during Audie’s 6 years with F C Barca. He explained that his speed and brutality towards basket were incredible. He remembers every movement of his experience at the games, every expression of the fans, every sensation in the Palau Sant Jordi and as Audie came onto the court the fans exploded with joy to the stands. Miguel has recently been part of the Association of Spanish Basketball Coaches Association (AEEB) and currently leads the AESE teams at Hospitalet. The kids have worked with the 7 values ​​that we spoke about on the first day of camp: hard work, consistency, competitiveness, faith, commitment, listening and passion for basketball. This Wednesday we will continue with our intense training. A lot of work on individual technique and resources to be able to put into practice in real game situations. “No pain, no gain”. Tomorrow we expect the visit of Jose Luis “Cuki” Galilea, International Professional Scout of the Indiana Pacers and ex-teammate of Coach Norris and player of FC Barcelona, ​​who will give a clinic directed especially to the Point Guards and Perimeter Players, we will also have the presence of Xavi Crespo, former FC Barcelona player and also ex-teammate of Coach Norris who will give a clinic on the proper shooting technique. Coach Norris is always grateful to his teammates for always supporting him and his camps sharing their experiences with the campers. Coach Norris always share with the campers that best part of playing basketball is not always about the wins trophies or championships but it’ the friendships he’s made over years of playing basketball that he’s most proud of.